Halo 4 is the arguably the best Halo game available. 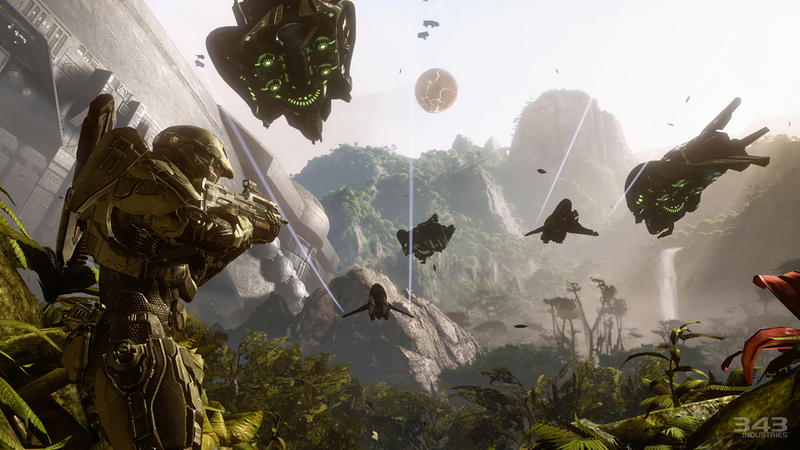 It takes all of what makes the Halo franchise great and improves upon it. Tight console controls, great graphics with a solid frame-rate (30), and a multiplayer experience that has more depth than most players will ever have time to fully realize. Not to mention an intriguing plot that presents new twists and character development to a story that I thought previously might have been running thin. I was wrong. I literally wiped a tear from my eye after sitting mouth agape for a couple minutes when the story concluded. Honestly though, the emotion I felt has everything to do with my being a big fan of the series. I doubt newcomers to the franchise will get as much from the story but that’s OK because it’s presented across a wide variety of scenic backdrops and includes some fantastic action. Starts slow but as the game progresses, the story presents some fun gameplay variety. Love the mech!! Campaign includes drop in/drop out co-op in addition to a separate co-op specific game type called Spartan Ops. Spartan Ops offers additional story after the conclusion of the campaign (can be played anytime however without need to complete the 1up portion) and is being handled like episodic content with new chapters being released regularly. First five are on the house (no charge) with no word yet on if future content will be available thereafter and at what price. Spartan Ops is fun but not as gripping as the campaign itself and ultimately feels more like a moving Horde mode/Firefight style of battle (kill a bunch of enemies, move to a new destination, kill more enemies, etc.). Not complaining though because it’s nice having more co-op options in a game that has so much more to offer. Its focus certainly isn’t on that aspect specifically. As with the previous iterations, multiplayer is where it’s at and this game is no slouch in that regard. If you’re a fan of the Halo series don’t worry that this iteration is being handled by a new developer (343 Studios). You can still buy with confidence. Fans of FPS games who don’t mind a space marine opera style of game also should give this game a chance. The controls and gameplay may just win you over. Not a fan of Halo? Well this probably won’t change things for you.